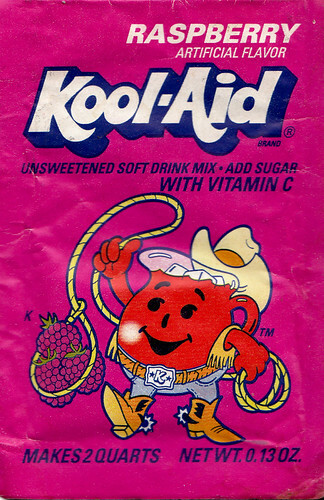 Kool-Aid Comes of Age was released in 1976 by General Foods. Sadly, there is no author credited. 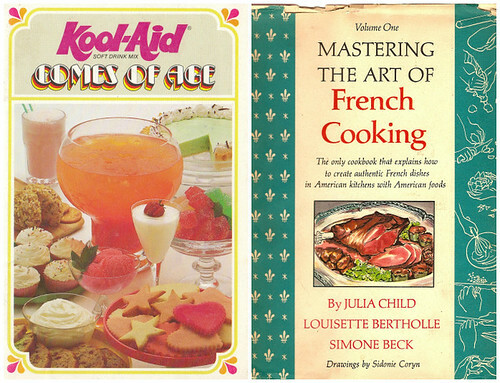 I’d like to think that the book was a collaboration that involved General Foods’ most adventurous maniacs sequestered in a kitchen lab with candy-colored stacks of dirty pots and pans everywhere and giant corkboards tacked thick with pencil-scribbled Kool-Aid-based food ideas. 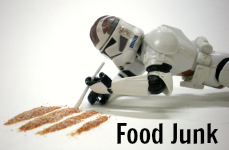 Ideas that were pared down only after months of Twelve Angry Men-like deliberation until the exhausted cooks emerged squinty-eyed into the sun clenching handfuls of tattered loose leaf paper containing the now legendary 63 recipes. Beverages is divided into three sections. Some Like It Hot has five recipes for warm drinks like Hot Cider Punch. Some Like It Cold has seven recipes for cold drinks such as a Lemon-Lime Lovely. Some Like a Lot has eight recipes for large quantity punches such as Regal Raspberry Punch. Stir-in and Pour-ons offers five fairly simple recipes in which Kool-Aid is mixed with a few ingredients for sauces and spreads like Whipped Lemon Butter. 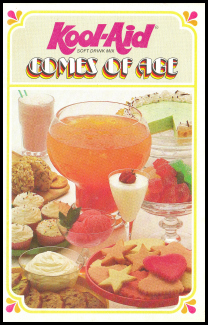 Party Ideas has six recipes for drinks and food such as a Sour Cream Dip designed to be served in a casual party atmosphere. It also contains a separate Halloween Party section with four additional recipes, including a pretty epic Kool-Aid Man-shaped cake. Easy and Elegant Desserts has eight recipes, including Cherry Bavarian Pie, to be served at your next, more formal, fancypants party. Kids’ Creations has seven recipes aimed at making the kids in your life happy. It is here we will find the classic yet most generic of snacks, the Snow Cone. Special Surprises, the largest section in the book, includes thirteen recipes that are “new twists for old favorites.” This is where everyday foods like Sweet ‘n Sour Pork and Glazed Carrots are infused with a “surprise ingredient.” Spoiler alert! It’s Kool-Aid. 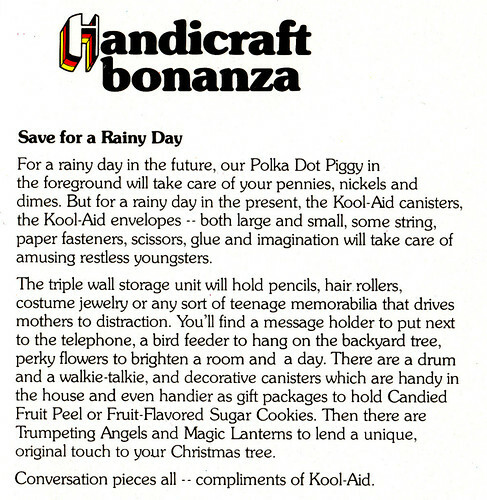 Kool-Aid Comes of Age also contains a bonus, non-food section at the back called Handicraft Bonanza where you can learn to transform all those Kool-Aid canisters and envelopes into fun crafts like piggy banks, bird houses, and drums. I’d like to work through this section as well, but the current canisters are shaped a bit differently. I’ll see what I can do. I’m pretty resourceful. The only real issue that might require an eBay solution is the lack of Raspberry in the current flavor line up. It’s beyond me why Raspberry isn’t around anymore. It was an original flavor! And sugar-sweetened Lemonade isn’t that easy to come by either. But I am going to push through any and all difficulties and earn my place in history. Because being the first and only person to do something is inspiring and impressive and important. Always.